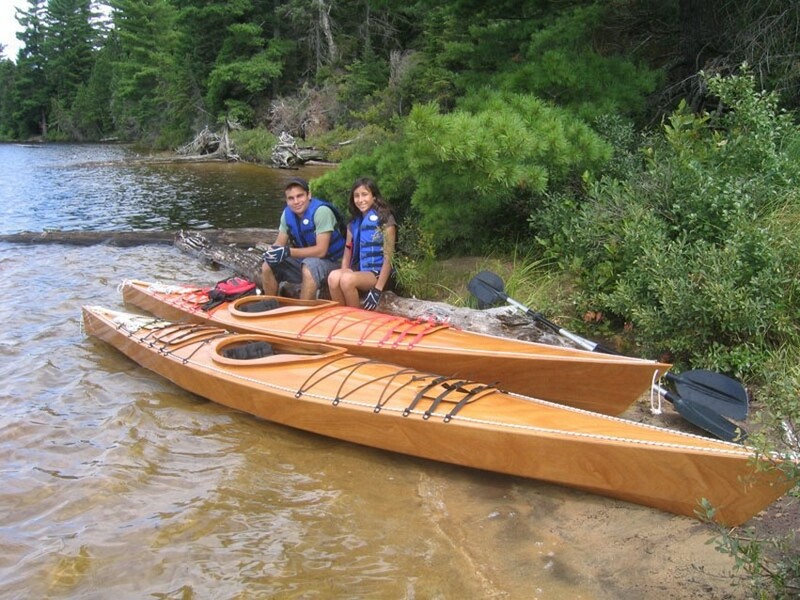 It all began when we went camping in Algonquin Park in 2005. We rented a couple of plastic kayaks and the kids loved it. 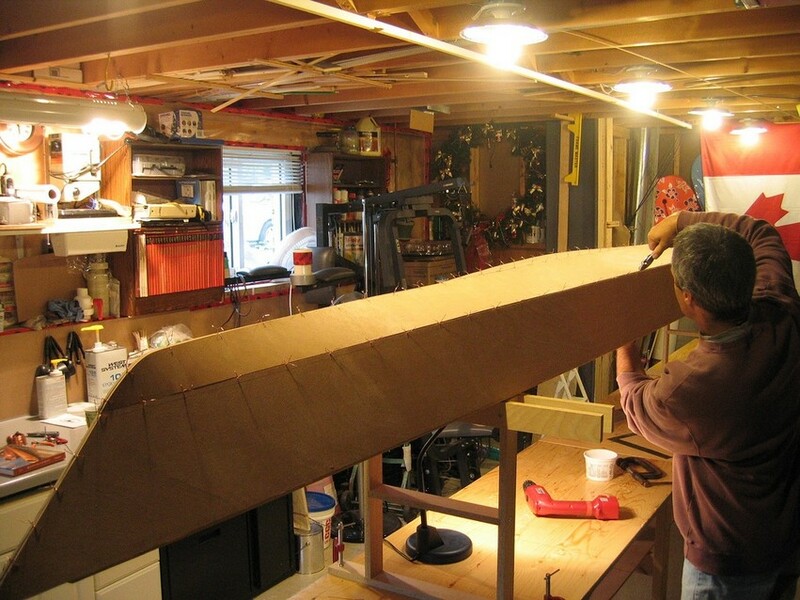 We came home with the intention of buying a couple of kayaks but while on the internet we saw these stitch and glue make’m yourself boats. 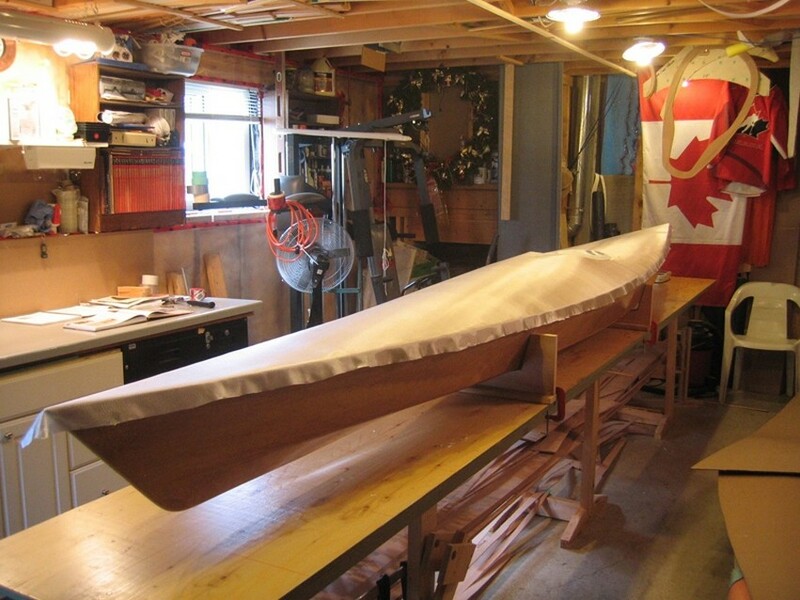 I purchased the books “The New Kayak Shop” and “Kayaks You Can Build. ”Both are available at Chapters or Amazon.com. We decided this was something we could do. 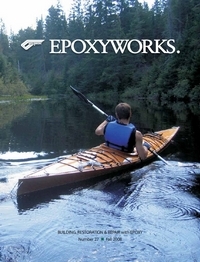 We also discovered www.clcboats.com which would prove to be a tremendous source of encouragement during the project. 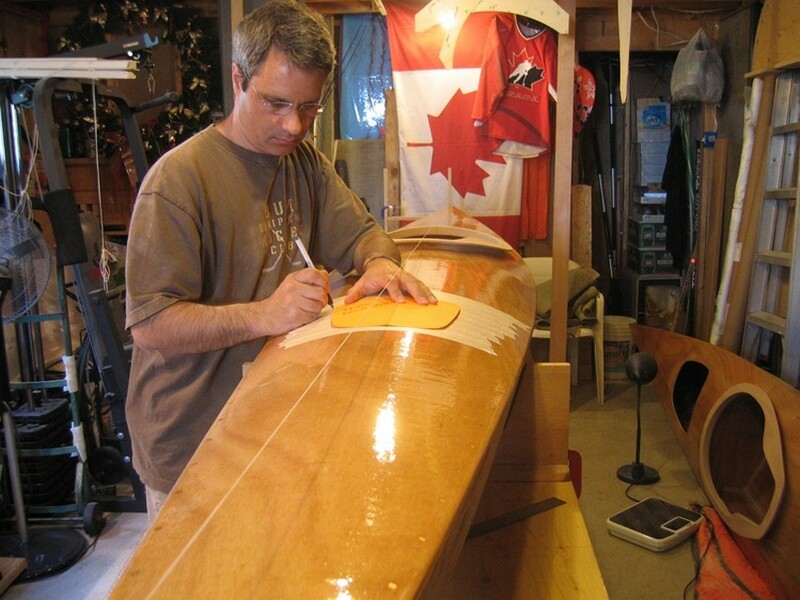 We made a day trip to Toronto to purchase plans for a Chesapeake Light Craft 16 and some marine-grade plywood. The books have some great suggestions for worktables. 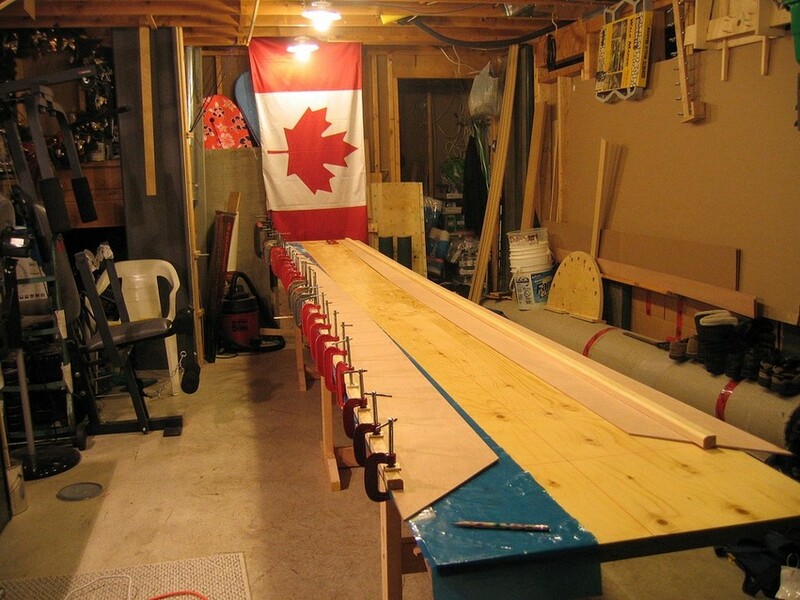 We made a 17′ one from some ¾” plywood and some stands from scrap 2×4’s from a recent renovation. 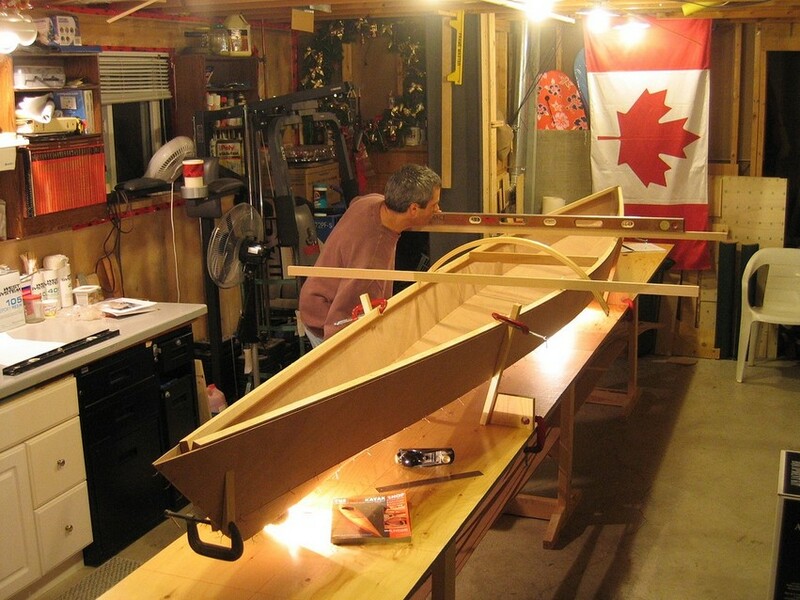 What follows is the the step-by-step story of the construction of these kayaks—from basement worktable in September 2005 through launching in July 2006.
from oozing out onto the panels. 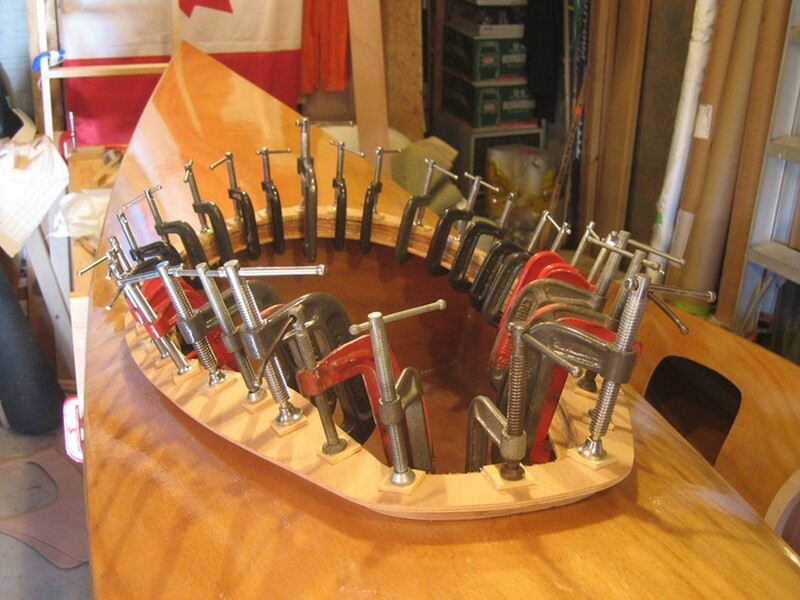 You can’t have too many clamps for this job. We did one side at a time. charm. We used 20-gauge copper wire from Home Depot. to the worktable. We then checked for any twists in the hull. 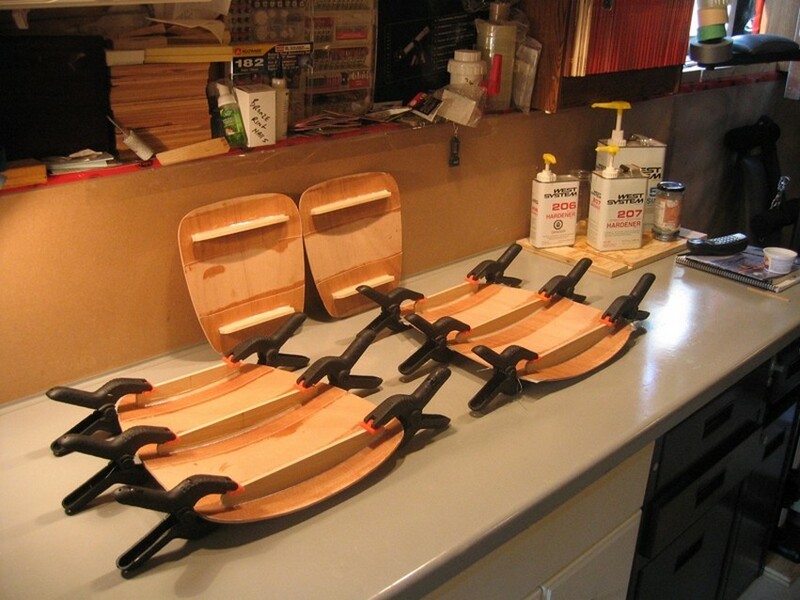 rounded plastic tools to apply the epoxy fillets. It’s not a bad job once you get the hang of it. for an easier, less frustrating job. 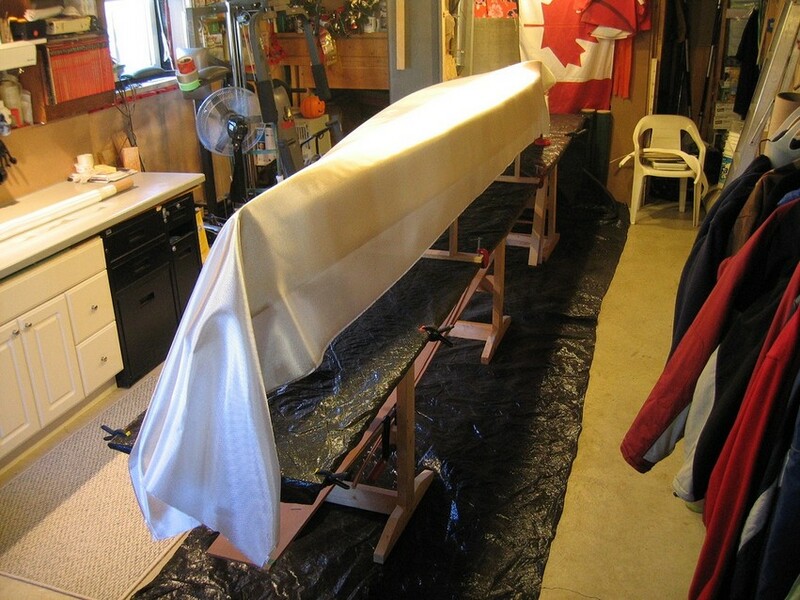 We brushed on then squeegeed the first coat of epoxy. juice cans for the grunge while squeegeeing—great idea. 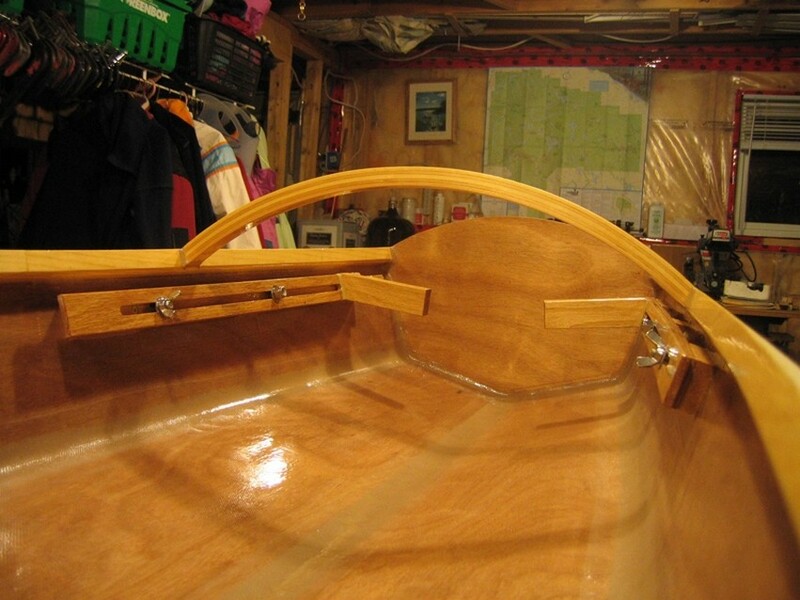 We covered the decks with 4 oz fiberglass and clear epoxy. Mom mixed the epoxy and I applied it. It’s a good team job. 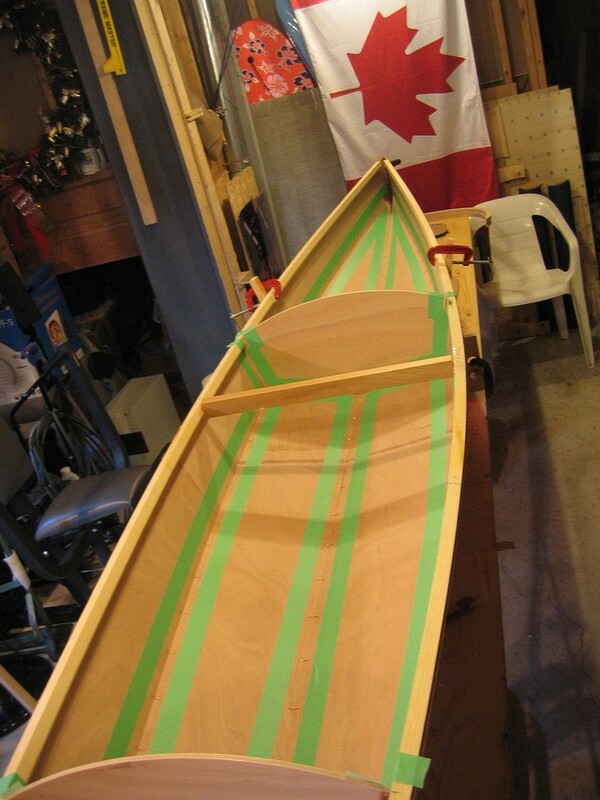 sound strange, but I found shaping the coaming enjoyable. the end they came in at 42 lb each. 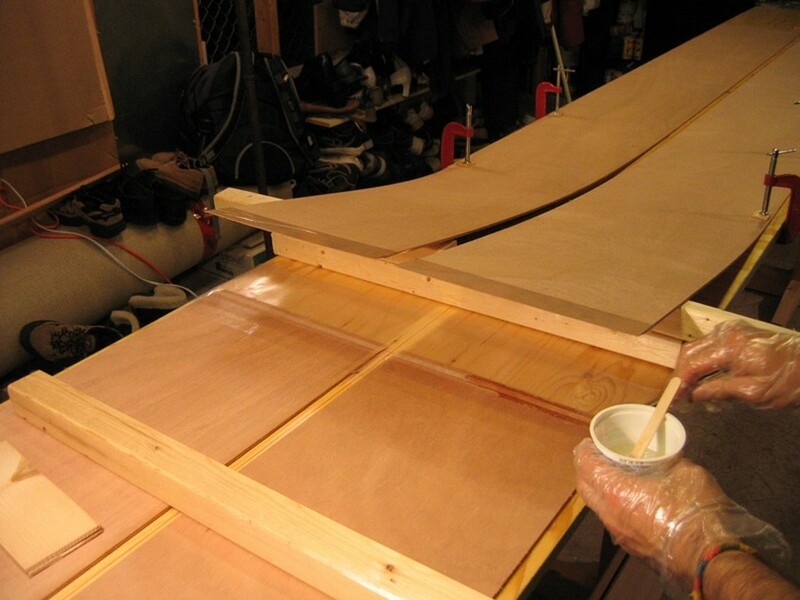 The hatch covers were cut from 4mm marine plywood. for sea trails on July 22, 2006. Annie’s getting a little impatient wit this epoxy business. 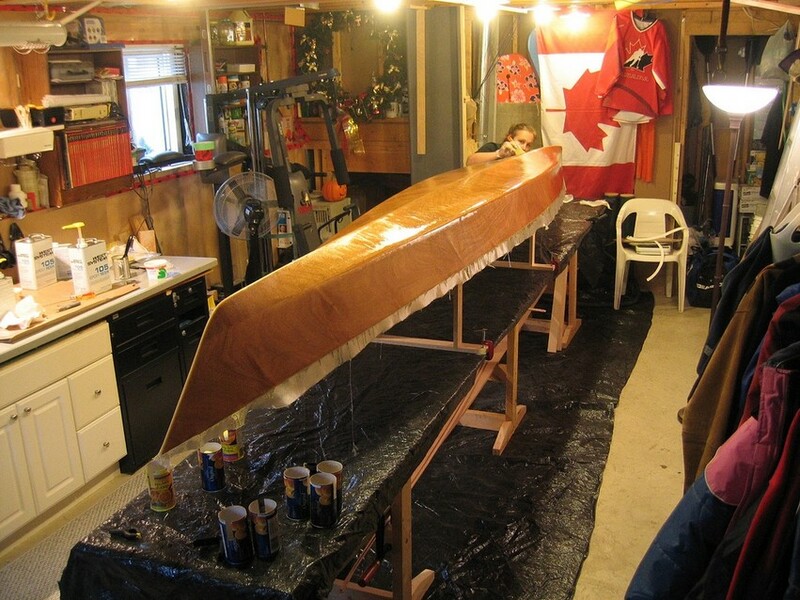 has its fifth and final coat of epoxy. 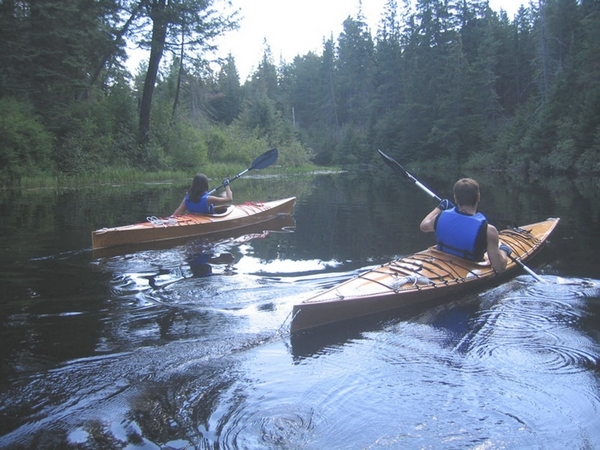 our asses trying to keep up in a rented 15′ fiberglass canoe.